The Boston Convention and Exhibition Center is Boston's main convention center. It's located in the redeveloped Seaport District, convenient to the airport, major highways, and with many bars and restaurants nearby. The Boston Convention and Exhibition Center is designed for large and small events and is still close (a long walk or short taxi ride) to downtown Boston hotels and restaurants. 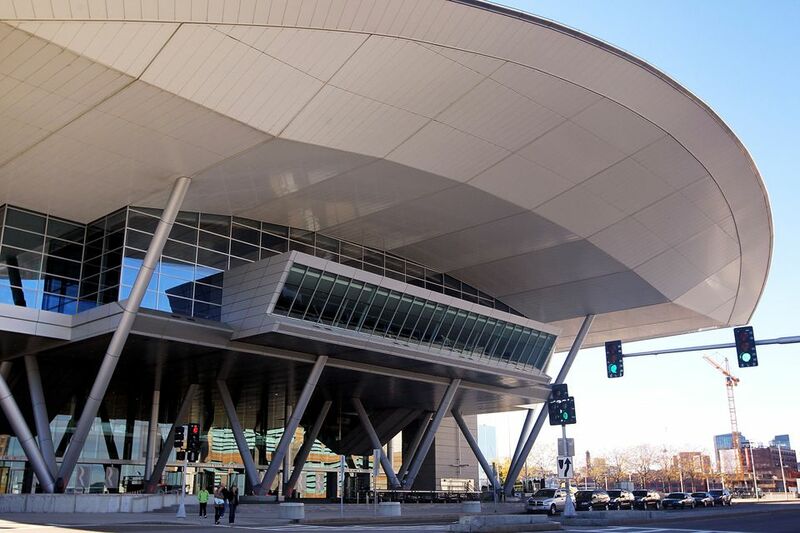 The Boston Convention and Exhibition Center has over 500,000 square feet of exhibit space that be divided into at least 10 different configurations. There's also 160,000 square feet of meeting space, and a 40,000 square foot Grand Ballroom. The facilities food court can seat up to 700 and the building is designed so attendees can travel quickly from one side to the other. The Boston Convention and Exhibition Center can be easily reached via car from just about any point. The facility is located at 415 Summer Street in the newly redeveloped Seaport District of Boston, along the waterfront. From Logan Airport (or Route 1A South), travelers can take I-90 West through the Ted Williams Tunnel to exit 25 (marked "South Boston"). Turn right at the top of the ramp onto Congress Street, and take the next right onto "D" Street. Just after the ramp, take another right onto Summer Street. From the West, take I-90 East to Exit 25 (marked "South Boston"). Turn right onto Congress Street, right onto "D" Street, and right onto Summer Street. From the East, travelers can take I-90 to I-93 south, exit 18. Take the left at the second traffic light (marked "South Boston Bypass Road) and follow it for about one mile. Turn right on Cypher Street and left onto West Side Drive. From the North, travelers can take I-93 South to Exit 20A (marked "South Station"). Turn left at the end of the ramp onto Summer Street. Follow Summer for about one mile. From the South, travelers can take I-93 North to Exit 20 (marked "South Boston") and follow signs for I-90 East. Take the first tunnel exit (market "South Boston"). Turn right at first set of lights onto Congress Street, and the second right onto "D" Street. After the ramp, turn right onto Summer. The Boston Convention and Exhibition Center is also convenient to a variety of public transportation options. From Logan Airport, travelers can take the Silver Line SL1 Bus and exit at the World Trade Center Stop. From there, take the elevator up to level 2, turn left, and the Boston Convention and Exhibition Center will be in front of you. From Amtrak and Commuter Rail lines, travelers can get off at the South Station stop and walk to Summer Street. Turn right and either take a taxi or walk (it's about one mile to the Boston Convention and Exhibition Center). From Boston's subway/T, travelers can take the MBTA Red Line, exit at South Station and either walk (per the directions above) or take the Silver Line SL1, SL2, or SL3 to the World Trade Center stop as above. The Boston Convention and Exhibition Center is also reachable via city bus. Inbound on #7 (City Point to South Station), get off at 415 Summer Street. Outbound from South Station get off at 425 Summer Street, turn right, and walk a half of a block. Surprisingly, the Boston Convention and Exhibition Center can also be reached via boat. City Water Taxi service between Lovejoy Wharf at North Station and the World Trade Center (about a ten-minute walk). The first choice for parking at the Boston Convention and Exhibition Center should be valet parking. Value parking is available during most events for $25. Turn from Summer Street onto East Side Drive. The valet area will be on your right and accepts cash and credit cards. Alternatively, visitors can self-park for $12 by continuing past the valet area and following the side of the building. Make a right at the end of the building to go down a ramp. Turn left at the bottom of the ramp and the entrance to the South Parking lot will be in front of you. If the event you're attending is very large, it's possible the garages will have reached full capacity. In that case, additional parking is available at the Boston Marine Industrial Park or at private lots on the waterfront. There is some limited meter parking around the Boston Convention Center. Surprisingly, you can check what's been found at the Boston Convention and Exhibition Center online at the Boston Convention and Exhibition Center Lost and Found page. Items are held for 60 days. For more information, contact the Public Safety Department at 617-954-2222 or 617-954-2111 for the Hynes Location. For places to stay near the convention center, consult this overview of Boston hotels by About.com's Guide to New England. Or these top-ranked best Boston hotels, as identified by About.com's Guide to Hotels and Resorts. If you have an early or late flight and want to stay near the airport, About.com's Guide to New England has put together this list of hotels near Logan airport. And on the other side of the spectrum, if you're a sports fan, you might want to consider hotels near Fenway Park.